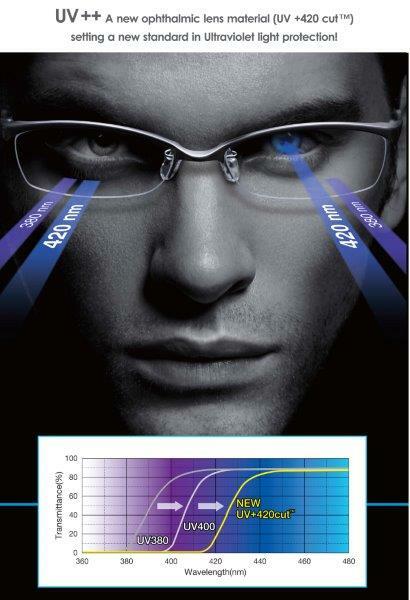 UV++ is a new lens material which blocks UV to 420nm with a secondary benefit of reducing blue violet light through to 450nm. UV+420cut™ technology is used to make a UV++ lens material that cut high-energy visible (HEV) light in the 400–420 nm part of the spectrum, in addition to blocking all UV wavelengths. This means it provides greater protection against the types of light that can damage the eyes. It’s thought that around 80–90% of the UV rays get through on days with light clouds vs. clear days. That number is around 60% on cloudy days and 30% on rainy days. UV++ lenses can be used by people of all ages, in almost any situation – for corrective eyewear, non-corrective “fashion eyewear” and sunglasses. UV++ is available in 1.5, 1.6 and 1.67 in single vision and progressives – including our own Exceed, Fine Focus, Success Advanced II, Office Vision and I-Focus. As the ultraviolet/blue block is embedded within the lens material, your patient can enjoy a standard emerald reflex MAR coating. The 400–420 light filtered out by UV+420cut™ technology has no effect on how colours appear. UV++ reduces the blue light that can cause eye fatigue whether at work or at play. Outdoor pursuits and extreme sports enthusiasts could well benefit from this new lens material’s protection for high altitude sports. The 1.5 lens material can be additionally tinted to 15% LTF and could even have a mirror coating applied if you are planning an arctic expedition. There are other sources of blue light that we all use every day! Artificial lighting, televisions, computers, tablets and smartphones all emit this blue light which can lead to headaches, eye fatigue and can interfere with natural sleep patterns. As cited on farmingfutures.org.uk, ‘Farming in a controlled environment, whether a greenhouse or warehouse, has long allowed growers to manipulate lighting, temperature and water to boost yields. What LED lighting brings to the equation is a cooler and more energy-efficient way to optimise conditions than the high-pressure sodium lamps traditionally found in green-houses.’ Depending on the output, cumulative exposure to these LED sources needs to be considered by those concerned with eye health. UV++ filters out harmful blue light radiation for clearer, sharper vision but still allows positive light wavelengths through. UV is not the whole story.